View More In Bar & Wine Tools. Perfect coasters for mug, glass, cup, beer, wine, bottle, etc. Made of environmental friendly material, they won't scratch your table and non slip. No smell and easy to clean. Beautiful cactus coasters set, DIY a cute cactus pot to add a little green to your counter top. The pot can be a small storage cup to organize you pins&clips in your office. Believe me! 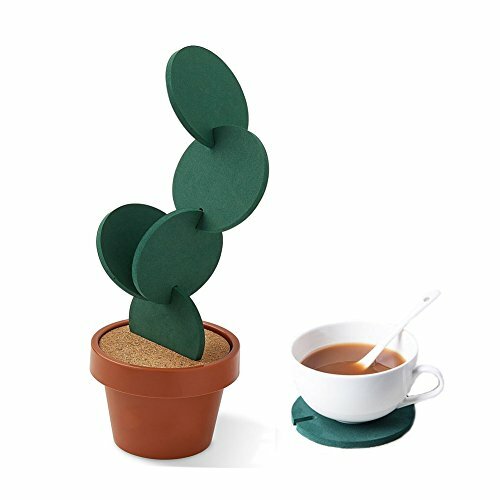 You'll get plenty of compliments on this adorable cactus coasters set. You satisfaction is our #1 priority, and with our exclusive money back guarantee, your purchase today has zero risk. ✔Material: Coasters are made of environmental EVA material, non-smell and non-toxic. Easy to clean, wipe it or throw it into your dishwasher after you used. ✔Function: The coasters can stand high temperature up to 450°F. They won't let the high heat damage your table and also prevent scratching the tabletop. ✔Package: This coasters set includes 6 round green coasters, 1 pot and 1 cork holder. 6 different size coasters help you get the perfect size for your cup, bottle or glass. ✔Gift Ideal: A perfect gift for holiday season, come with cute package. Funny Cactus pot design gives your space green and vitality. Perfect decor for home and office. ✔Multiple-Use: DIY your own shapes of cactus and have fun! Otherwise the pot can be a useful small storage cup. Your can put small clips or pins to keep your table clean. If you have any questions about this product by Miragee, contact us by completing and submitting the form below. If you are looking for a specif part number, please include it with your message.